This week, WSPC staff traveled to Los Angeles, California for the Western Food Service and Hospitality Expo. The three-day convention featured everything from healthy foods to coffee. Staff members were able to speak with chefs, distributors, restaurant owners, school system employees, and TV show hosts. WSPC staff passed out free potato peelers, recipes, and information to over 6,000 people! Attendees LOVED our potato peelers and were very excited to learn more about potatoes. Several attendees were curious to learn about what makes Washington potatoes the best. Our long warm days and cool nights create the perfect growing conditions for spuds. Not to mention, our soil is naturally enriched with vitamins and minerals. 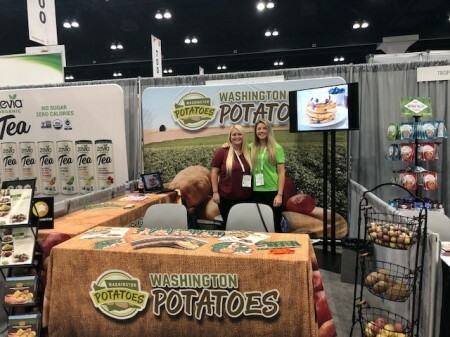 Washington spuds are a non-GMO, gluten free vegetable that can be enjoyed in a variety of ways. Many attendees were interested in ordering our delicious Washington potato products since we can ship so easily to California. Without a doubt, this was a worthwhile show, and many people were able to take home an important message: WE GROW THEM BETTER!